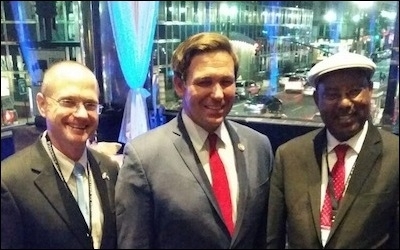 Israeli MKs Oded Forer (left) and Avraham Neguise (right) with Rep. Ron DeSantis (R-FL) in New York last night. PHILADELPHIA – November 13, 2017 – Members of the Knesset Israel Victory Caucus (KIVC) have arrived in the U.S. to meet with their counterparts in the Congressional Israel Victory Caucus (CIVC) and sign an unprecedented joint declaration of support for and cooperation towards an Israel victory. Members of Knesset Oded Forer (Yisrael Beytenu) and Dr. Avraham Neguise (Likud) will meet on Nov. 14 with the chairs of the CIVC, Reps. Ron DeSantis (R-FL) and Bill Johnson (R-OH), and other members of the caucus. Together, they will sign a Joint Declaration of Principles, which includes support for Israeli victory and the requirement that Palestinian leaders recognize the State of Israel as the national homeland of the Jewish People. On Nov. 15, MKs Forer and Neguise will meet with White House officials and lead a panel discussion on resolving the Palestinian-Israeli conflict. Launched in April 2017, the CIVC has 26 members of Congress. Launched in July 2017, the KIVC has 15 representatives from all Zionist parties in the Knesset. This is the first joint meeting of the CIVC and KIVC; it is also the first-ever effort of caucuses in Congress and the Knesset to work together to end the Palestinian-Israeli conflict. The two caucuses were formed with the support of the Middle East Forum, led by Daniel Pipes, who launched the Israel Victory Project (IVP) earlier in 2017. Instead of diminishing Palestinian rejection of the Jewish state, the Oslo 'peace process' has encouraged it. IVP maintains that the Oslo "peace process" has failed; instead of diminishing Palestinian rejection of the Jewish state, it has encouraged it. Something new and fundamentally different is needed. IVP promotes a paradigm for resolving the conflict that supports an Israeli victory and a Palestinian defeat. It argues that both sides will ultimately benefit from this, and especially the Palestinians. Israeli and U.S. legislators will be holding several media briefings and public meetings in New York and Washington, DC, from Monday, Nov. 12 through Wednesday, Nov. 15. For more information or details about attending any of the briefings and events, see the contact information below. Related Topics: Arab-Israel conflict & diplomacy, Arab-Israeli debate in the U.S., Israel & Zionism, Palestinians, US policy receive the latest by email: subscribe to the free mef mailing list This text may be reposted or forwarded so long as it is presented as an integral whole with complete and accurate information provided about its author, date, place of publication, and original URL.